The Tuatapere area has a direct link to New Zealand's early history. Captain Cook first visited Southern Fiordland in 1770. Anchoring in Dusky Sound to replenish his supplies he was impressed by the scenery of the area. 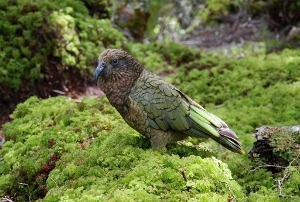 Cook encountered some Maori during his visit to Dusky Sound. Although relatively sparse in the area, these Maori are thought to be the scattered remains of the Katimamoe tribe who had escaped from Preservation Inlet where they had been defeated in battle by the Kaitahu tribe. The descendants of these people survived through until the nineteenth century. Rumours of a "Lost Tribe" in the area have persisted even until fairly recently. From around 1809 the area was reasonably active with whalers and sealers. Tuatapere township was originally the site of a punt that ferried passengers across the Waiau River. The punt was owned and operated by the Government. At this time the area was known by the name Papatotara, but when this name was given to a settlement six miles towards the coast, a new name was sought. When a Post Office was established in 1904, the area was renamed Tuatapere. Sawmills and flaxmills were in operation near the turn of the century and new settlers actively cleared bush and scrub to establish farms. At its peak 30 sawmills were operating in the area. 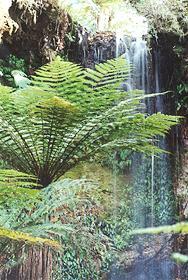 Forestry and Farming are the main industries, with Tourism growing. Tuatapere can be reached by air from both Invercargill and Queenstown Airports. A daily shuttle service is available between Invercargill and Te Anau. Contact Spitfire Shuttles (Phone 025 359 529) for more information. Tuatapere is built on the majestic Waiau River and has a lovely domain where you can stroll among the native bush enjoying peace and tranquillity. Tuatapere is a service town with facilities many larger towns would be proud of. Most of your daily requirements are catered for. Tuatapere is an ideal base from which to explore the surrounding forests, beaches, lakes, historic sites and a World Heritage area. The Bushman's Museum provides a "picture of Tuatapere's past". There is a comprehensive photographic record of early milling operations and a static display of milling equipment at the museum. Orepuki had its beginnings when gold was discovered in the black sand of its beach in 1865. The first tent town was at Monkey Island in the lee of which ships anchored. A second township lay to the north of the present one, known as Garfield. The people and their houses, including the school, shifted to the present site when the miners sluicing up the creeks wanted to sluice the ground under the town. Other industries to wax and wane have been sawmilling, coal mining, a shale works, a smelter to extract platinum, a flax mill and farming which remains as the main industry today. An array of old buildings still exist. A tavern is now the most prominent business in the main centre. 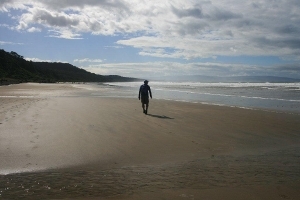 Situated ½ km north of Orepuki, this beach has a wild fascination. The following gems can be found: hydro grossular garnet, orbicular jasper, garnet sands, rodinguite quartz, simi nephrite, fossil worm casts, oil shale and elusive sapphire. (Te Puka-a Takitimu, the anchor stone of the great canoe Takitimu, which as legend tells, was wrecked on the bar of the Waiau river). A favourite with the children, this attractive beach is safe for swimming, picnicking, rock fishing and wind surfing, Hectors dolphins are often seen here. Facilities include toilets and a changing shed. Cosy Nook is a picturesque craggy cove sheltering several fishing boats and holiday cribs. Steeped in Maori history, early settlers reported Pahi's village as a Ngai Tahu settlement with some forty houses. The small island Matariki was once a defended pa site. Five rocky outcrops from the islands 70 kms south west of Te Waewae Bay. 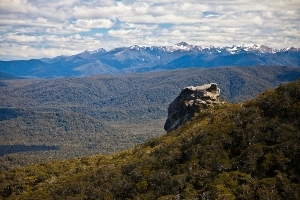 They can be seen on a clear day from McCracken's Rest lookout along the Southern Scenic Route. In 1809 five sealers were placed on the main rock to kill seals. Their ship sailed away leaving the men marooned for four years until the ship 'Perseverance' noticed their signals and picked them up. Hunting deer proves to be increasingly popular in the Rowallan, Waitutu, Dean and Longwoods forest areas. To ensure your safety and a quick recovery if needed while tramping, hunting or boating hire a LOCATOR BEACON. This beacon can either be activated by the wearer or by remote control from base in the event of a mishap. Controlled by Southland's Locator Beacon Charitable Trust in Tuatapere. For further information contact the Tuatapere Information Centre (03) 226 6399. The Port Craig viaducts were built of Australian hardwood in the early 1920's to open up the western Southland forests to logging. 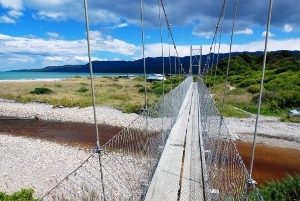 Four viaducts are still used by trampers to provide access across ravines through the Waitutu Incorporation lands between Port Craig and the Fiordland National Park south coast area. 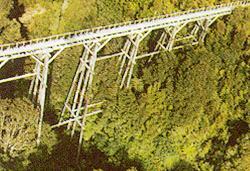 The viaduct at Percy Burn (36 m high, 125 m long) is the largest surviving wooden viaduct in the world. 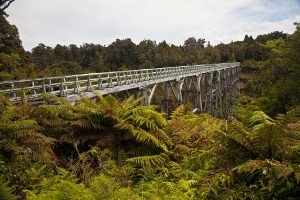 A Trust has been set up to restore and preserve the viaducts which are recognised as one of New Zealand's foremost engineering feats and form part of an historic and unique bushwalk. Port Craig was the site of New Zealand's largest sawmill in the 1920's. It was established in 1916 and closed in 1930. The mill itself was two storeys high and produced up to 1800 cubic metres of sawn timber a month. The mill was famous for the use of the Lidgerwood steam hauler, the largest to be used in the New Zealand bush. Once a thriving township, at its peak the population was 230 with the mill employing at least 150 people. Today only remnants are left with the school being used as a hut for the South Coast Track. Hectors dolphins and whales frequently swim in the bay with some whales known to have stayed there for breeding. There is an abundance of shellfish at Bluecliffs beach. This huge sweeping bay has nothing between it and Antarctica. Depending on the day the sea can be clear and inviting, or it can churn like a bubbling cauldron spraying sea mist high onto the cliffs. 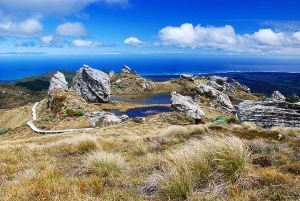 Te Waewae Lagoon can be seen from the hills outside Orepuki. Lake Hauroko is New Zealand's deepest and most scenic lake. 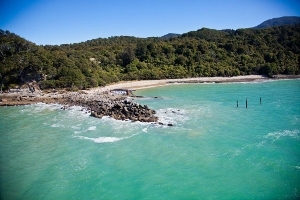 It offers the opportunity for kayaking, fishing and access to the Dusky Track and Wairaurahiri River. The "Big Totara Tree" track is a loop walk in the Dean Forest. This huge Totara tree is one of the largest known and is over 1000 years old. There is a well marked track to follow through the reserve. Historic Bridge and Limestone Caves. Clifden's historic suspension bridge opened in 1899, a fine example of 19th Century design. The limestone caves at Clifden are open to the public and can be explored. Make sure you have the right equipment and, before leaving for the caves, check with the Tuatapere Information Centre. Lake Monowai is a picturesque lake well known for its good fishing and hunting. It's a very popular spot for campers and trampers. Monowai Power Station was opened 1 May 1925 and it still services the Southland District. It is one of the oldest and most scenic power stations in New Zealand. Meridian Energy Tuatapere's Wild Challenge: A tough endurance race for top athletes, 2nd Saturday of January. Waiau Grunt: Another endurance event, less rigorous than the Wild Challenge, but not one for Sunday joggers either. 2nd Saturday of January. Meridian Energy Waiau A & P Show: A close-up view of farming at a traditional country show, livestock, showjumping, displays. Held mid January each year. Red Stag Trophy Day: Held in May each year. (Western Southland Deerstalkers Association). Waitangi Day Charity Golf Tournament. Tuatapere Annual Garage Sale: Last Saturday of October. Where the whole town becomes a garage sale. 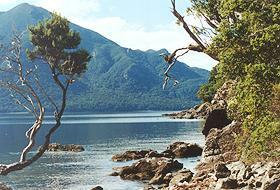 Dusky Track links Lake Hauroko with Lake Manapouri and includes a two day detour to Supper Cove in Dusky Sound. 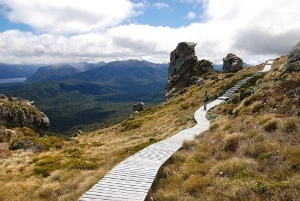 It is an 84 km tramping track which requires at least 8 days to complete. The track is suitable only for well equipped and experienced groups. The South Coast Track begins at Bluecliffs Beach and extends to Big River at the edge of Fiordland National Park. Four days are required to reach Big River. 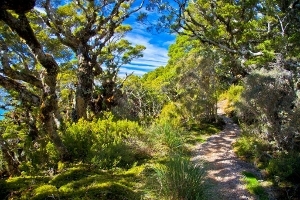 The track gives access to an area rich in social and natural beauty. 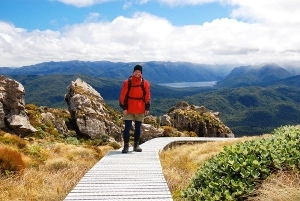 The Hump Route links Te Waewae Bay with Lake Hauroko in Fiordland National Park. 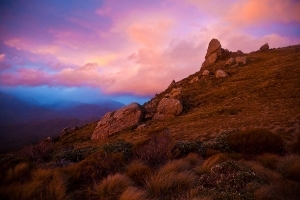 It passes above the bushline and provides spectacular views over the south coast and inland lakes. The track which opened in 2001 includes the Hump Ridge, the existing walking track from Bluecliffs to Port Craig and the viaducts and makes for an extremely diverse, if not the most diverse of the major walking tracks in New Zealand. The experiences for the user includes landscapes ranging from coastline, podocarp forest, beech forest to alpine settings within a walking distance of approximately 53 kilometres. Where else on a walking circuit in New Zealand could one expect to see both Keas, Seals and Hectors Dolphins. This trip includes outstanding scenic qualities, special ecological values and a rich history of both Maori and European endeavour in a remote and wild part of New Zealand.